While they were between tours, practice spaces and studios they managed to drop off a picture and we’ll take it! They’re on the road yet again supporting their new release on Relapse Records. I think the picture is sufficient as you can see how Michael works, you just got to turn him around and tell him to stop staring at my soul…. I have been progamming beats and playing synths for the band Genghis Tron for the past 3 years. 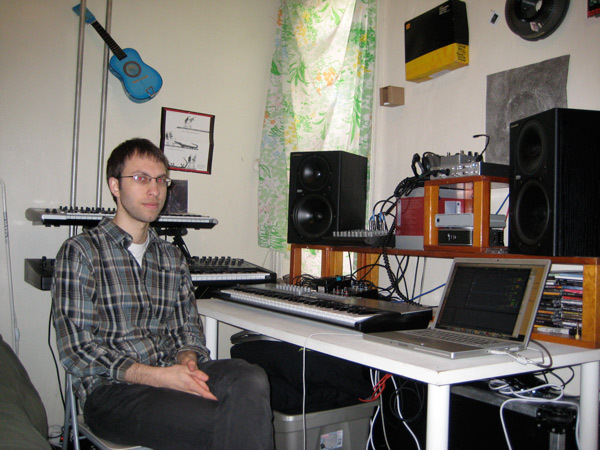 Before that I was experimenting with electronic music on my own beginning around 1999 or so. My newest synth is an Alesis Andromeda which I like a lot. It is a great analog synth that has more flexibility than other analogs because of its high polyphony, excellent envelopes and well routed modulation matrix. I also use a Novation KS-4. Our live set up consists of the three of us. I play the Andromeda and Novation KS live and our singer also plays a rack Moog Voyager and controls our drum tracks through a Roland sampler which is triggered via midi remote controller. We also have a guitar player who uses many pedals. Remember You First Piece of Hardware? A crappy Korg EA1. Worst synth ever! For making beats on the computer I really like Native Instruments Battery 3 for drum sampling, which I run through Ableton Live. As for how I am influenced by my surroundings, I would say very little. No matter where I am, I’m still just staring at a computer screen! The biggest distraction from writing music is the internet. The fact that the music is being made on a computer doesnt help. It’s very easy to stop working on a beat and check e-mail for no reason. Also, the desire to hangout with friends instead of being alone in your room working on music. i think that making on a computer is very easy if you practice enough and have a reasonable amount of time and patience. I really like functions that help randomize music in subtle and clever ways instead of doing it manually. It would be nice if I had access to more plug ins and programs that help with automating patterns in unpredictable ways. My friends and family are very supportive. Even my grandmother has a copy of one of our CD’s. Most of my family don’t really “get” the music but they are supportive anyways. My dad actually digs the music which is cool. I’m very lucky to have the support of my family and friends! What I’ve found is that there is a way to do anything, but not through one program. What I mean is that some programs are good for one thing, and another program or plug in will be good for something else. So I wouldn’t want to put one single tweak into a program, but rather build one super program that could do everything! Michael Sochynsky was born in Berkeley, California and currently resides in Philadelphia, Pennsylvania. Genghis Tron can be found on Relapse Records, Crucial Blast Records and Myspace.